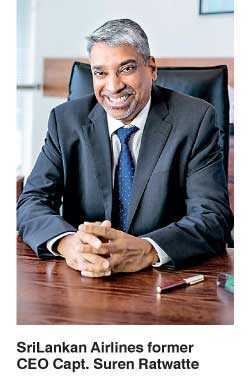 Captain Suren Ratwatte, who resigned recently as the CEO of SriLankan Airlines after serving since October 2015, took some time off before embarking on his new plans for an interview with the Daily FT to share some insights on the future of the national carrier and overall challenges in the aviation industry. Captain Ratwatte is a pilot with over 30 years of experience in the field whose first appointment was with SriLankan’s predecessor, Air Lanka in 1984. He joined Emirates in 1989, where he held several positions in the company. He possesses over 18,000 flying hours in a number of different types of aircraft, including the Boeing B-777 and Airbus A380. Captain Ratwatte is a holder of Bachelor’s and Master’s degrees from the Embry Riddle Aeronautical University, a Fellow of the Royal Aeronautical Society and an author of several published works. He is a well-known human factors researcher and practitioner, having published a number of articles and essays in the field. His expertise includes a variety of senior instructional and management roles in airlines, most recently he was the Human Factors Manager of Emirates Airlines. Following are excerpts. Q: It’s been a month since you relinquished your post as CEO. What are your thoughts on the airline’s future? A: I don’t want to proffer advice to the new team which is at the helm. My views have been passed on to the Chairman and the board; they may treat them as they wish. But I’m intent on making a clean break and do not intend to be an ‘armchair critic’ - there are plenty of people doing that already. The future of the airline really depends on two critical factors. One is the state of the airline industry worldwide and the other what the shareholder/decision-makers wish for the airline. Q: Would you care to elaborate? A: Well the airline industry is in a very interesting phase. Since the concept was imagined just 100 years ago, it has undergone many changes. When airlines began to be popular, just after WW2, every country wanted to have a national carrier to fly their flag all over the world. The advent of airlines run as a business has meant that the laws of economics dictate their size and shape. Most successful airlines today are large groups. IAG, which dominates Europe and comprises British Airways, Iberia and a few other smaller airlines with over 550 aircraft, is a perfect example. The three giant US airlines (American 950+ aircraft, Delta 500+ and United 750+) are the result of many years of painful consolidation that took place since deregulation in the 1970s. All these airlines have adapted to the changed environment and are very different beasts to what they were when they were founded. Turkish Airlines is one of the few legacy flag carriers that have adapted well to the changing climate. With over 300 aircraft it is an efficient and profitable competitor, exploiting a strategic geographical position and worldwide network to great advantage. By being huge and dominant, these mega airlines can dictate price by controlling capacity on the one hand. They are also able to control costs by their massive purchasing power. Three of the main cost centers for any airline business are the ownership cost of the aircraft, the maintenance costs and of course fuel. All three of these respond well to scale and purchasing power. Smaller airlines don’t stand a chance. Right now the advent of the Low Cost Carriers (LCCs) has changed the entire business once again. Again huge groups with usually one type of aircraft dominate. Southwest in the US, which is under the legendary Herb Kelleher and invented the LCC and operates over 700 B737s, is the best example. Ryanair (300+ 737s) and EasyJet (300+ Airbus 319/320/321) in Europe, Air Arabia and FlyDubai in the Gulf, Air Asia and Lion Air in our region are the main players. Indigo and SpiceJet are also doing well in the rapidly growing Indian market. Q: How have these trends affected the local market? A: The lucrative top end of the market has been taken over by much larger airlines. Emirates, Qatar and the other gulf carriers dominate the traffic between Europe and this region. Competing against them is very hard. The product is superb and they have economies of scale as well as strong state support, but their bottom lines are questionable. Both Qatar and Etihad have released results showing huge losses. Emirates does publish results, but does not report the airline segment separately. To the east, SIA, Cathay Pacific and the Chinese airlines have a large share of the market. The Chinese giants, Air China, China Eastern and China Southern are state owned with opaque financials. It is very hard to ascertain how well they’re doing. Cathay is struggling and even the mighty SIA is relying on the other parts of the group for growth. Actually SIA will probably pull out the main brand from Colombo and let one of the other airlines in the group (SilkAir or Scoot) take over, as the market yields are quite poor in this sector. The reason for this yield degradation is that LCCs are grabbing market share at the lower end. Their laser-like focus on costs mean that they can be profitable even in a low-yield market like Colombo. Anyway, the capacity they devote to Colombo is so small that revenue degradation on this sector doesn’t affect them that much. The entry of Indigo to the Colombo market for example has lowered yields significantly on the Chennai and Bangalore routes, both of which are very important for SriLankan. But they are a tiny segment of Indigo’s much larger market. Q: Obviously Sri Lanka is too small a market for such economies of scale, so what do we do? A: That is the billion-dollar question. What do the policymakers want for our country? Is it important to prop up the national carrier or to facilitate the maximum number of passengers arriving into and departing our shores? Judging by the scale of the new developments taking place, with hotels and apartment buildings mushrooming everywhere, maximising inbound tourism would seem to be the need of the hour. In fact the Tourism Development Authority has set a target of five million passengers by 2020, which is double the current number. So it is a national imperative that we increase capacity to the country. In the meantime we have a ‘legacy cost’ national airline that just cannot compete in the low-yield fare structure that exists in and out of Colombo, which is now the cheapest place in the region to fly in and out of. For SriLankan to add capacity is extremely difficult, if not impossible, given the structure of the airline. Q: Can’t both be done, keep the national airline as well as provide for more passengers? A: Well, perhaps. But like all growth markets, ours is a very price conscious one. The LCCs will always be the dominant player in a market such as this, at least until our GDP (and consumer spending) grows to a much higher level. So the focus must always be on lowering the cost of operation, which can only come through efficiencies. The only other means of increasing yield is by controlling capacity. That is to stop foreign airlines from flying in and ensuring that the national carrier has a 50% market share. But is it in our national interest to do so? That question has already been answered. It is a national priority that we encourage more airlines to fly in, which in turn means controlling the cost of operating in and out of Colombo. As long as some of the variable costs such as fuel, ground handling and catering are monopolies, they will not be cost-efficient. India has dramatically reduced the costs of these services by introducing competitive providers. This reduces ticket prices and encourages more people to fly, who are needed if we are to fill all these hotel rooms that are being built. What do the policymakers want for our country? Is it important to prop up the national carrier or to facilitate the maximum number of passengers arriving into and departing our shores? Q: So you’re suggesting that the services at Sri Lanka’s airports be opened up to multiple suppliers too? A: Yes - if the policymakers decide that throughput is the important factor. I don’t make policy, which is someone else’s responsibility. But as someone fairly knowledgeable in the field, I see this is a vital first step. The National Civil Aviation Policy, which is in the process of approval, needs to be addressing these issues. There are very capable and efficient global companies that will provide fuel supply, ground handling, catering and even run the airport terminals. They will do so in competition with each other, without state funding and at a much lower price. At least two providers of each for Katunayake and competitive bidding for other airports will see huge growth without the state having to divert funding to any of these facilities. The country needs huge investments in the aviation infrastructure. Another terminal building plus a dedicated LCC facility at Katunayake is only a start. The airport also needs more cargo handling capability, improvements to the Air Traffic Control infrastructure as well as the taxiways and aprons are long overdue. Eventually another runway will be necessary. All this can be done without the use of state funds quite easily, the expertise and capital exists. It just needs the right climate for global companies to come in and invest in Sri Lanka’s aviation sector. Q: But won’t that ruin SriLankan’s finances? A: To some extent yes. But cheaper fuel, more cost-effective ground handling and catering will mean the airline saves money. Like any successful enterprise it must concentrate on the core business. There are good and potentially profitable routes the airline has, particularly the long haul ones such as London, Tokyo, Beijing, Shanghai and Melbourne, on which there is very little direct competition. By concentrating on these the brand can be preserved, if that is the wish of the shareholder. But doing so will mean lowering costs. At the present cost structure, even these potentially lucrative routes run at a loss. Sadly, the future of all ‘full service’ airlines is in grave doubt. The Gulf and Chinese carriers have opaque balance sheets and are supported by cash-rich nations. Those without such advantages are only surviving either by being part of a large group with economies of scale or controlling a niche market. American, Delta, United and IAG fall into the former category. Qantas, a relatively small airline, has prospered by controlling capacity in Australia and using its LCC (Jetstar) to lower costs. Air New Zealand, Hawaii Airlines, Fiji Airlines and Air Mauritius are examples of carriers that control isolated markets. State-owned airlines are vanity projects that are no longer relevant. Some nations with comfortable balance sheets may be willing to subsidise airlines for reasons of national pride, strategic depth or some other motive. Many countries have taken the pragmatic approach and let market forces decide what airlines serve its shores, rather than expend scarce resources to prop up an uncompetitive national airline. What our decision-makers choose remains to be seen.